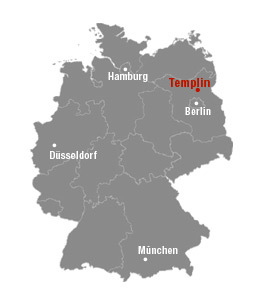 The town of Templin is situated in the northern part of the federal state of Brandenburg in the western Uckermark region and is about 80km from Berlin. In Templin, use of public transport is free of charge for holders of the health resort card or the ThermenTicketTemplin. 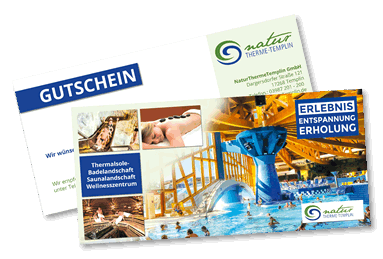 In this way, there are no additional costs for you for the bus transfer from “Templin Stadt” railway station to NaturThermeTemplin. At the “Templin Stadt” railway station, there is a bus stop from which you can reach NaturTherme within five minutes without changing the buses. If arriving on the B109 road from a southerly direction you reach Templin via Zehdenick. If arriving on the B109 road from a northerly direction you reach Templin via Prenzlau and Hassleben. If arriving on the B96 road from a northerly direction you reach Templin via Fürstenberg/Havel and Lychen. If arriving on the L100 road from a southerly direction you reach Templin via Zerpenschleuse. Motorway exits from the A11 motorway at Finowfurt, Joachimsthal (the throughfare through the village is blocked, there is a big diversion!!) and Pfingstberg.